Employees of The Bensman Group got an early start on the holidays as they volunteered at the Northern Illinois Food Bank distribution center in Park City, Ill. This was the second year that Bensman has chosen to work with this charity, which helps to provide nutritious food to people in need. The NIFB works with 665 partner agencies in 13 counties in northern Illinois. About 20 Bensman employees went to the NIFB warehouse on Oct. 22 from 1 p.m. to 4 p.m. to help repackage frozen meat donated by area supermarkets. They unpacked several huge pallets of frozen meat, then separated and sorted the meat. Finally, they repacked it into 20-pound boxes, each holding a variety of kinds of meat. Those boxes then were distributed to area food pantries. Finally, they crushed the cardboard and cleaned up the area. In choosing the NIFB for this effort, Bensman looked for an organization that was fairly close to the firm’s Bannockburn office and that would allow them to come in as a group. Part of the goal of the project was to allow Bensman employees to work together as a team. “When we worked in the NIFB distribution center, we were reminded of the invaluable lesson of teamwork,” said Joel Feiger, President and Chief Operating Officer of The Bensman Group. “In our business, we incorporate teamwork as much as possible in order to ensure our clients receive the value they expect." However, the goal was much more than teamwork, he said. In the spirit of Thanksgiving and the coming holiday season, Bensman wanted to put its teamwork to work in an effort that would bring tangible benefits to people in need. “The great purpose of NIFB is feeding thousands of potentially starving people on a daily basis,” Feiger said. “We, at The Bensman Group, feel blessed to have an opportunity to help in this worthy cause." The NIFB provides food for almost a half-million people every year. 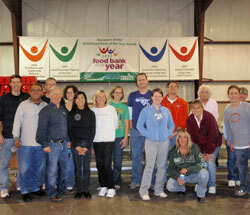 In the last fiscal year, the food bank distributed more than 35 million pounds of food, which was a new record. If you are interested in learning more about the NIFB or helping in its efforts, please visit www.northernilfoodbank.org.